I love riding. Day or night, I will hop on my motorcycle and just go! There is some freedom that it gives you, especially if your country allows you to go between cars when traffic is at a dead still! My first year of riding I was working night shifts, meaning I would leave at 9pm for work and get off at 6am. 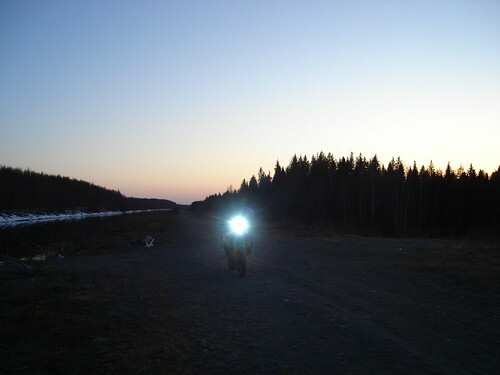 In the fall and early spring, night riding was unavoidable. Here are some tips all motorcyclists, whether new to riding or have years of riding experience under their belt, should keep in mind when riding at night. Always remember, safety first! Give your eyes time to adjust. If you are coming out of a well lit office or restaurant, give your eyes 5 or 10 minutes to adjust to the darkness. Don’t just hop on the motorcycle and start riding. Remember, you need to be able to react quickly, and if you can’t see properly then your reactions will be slowed. nor thirsty nor hungry. This goes for day or night riding. However, since most of us do sleep in the evenings, you may be more tired at this time. Make sure you are awake enough to drive competently and be as well rested as possible. Be aware of night creatures. During the night, when the sun is down, there are certain creatures that come out that may not be around during the day. If you are driving outside of the city, especially between fields and open roads, be extra cautious. These night creatures can run across your path, and at night you might not see them until they are already under your wheel. If you do see one of these creatures in your way, and they are small and will not damage your motorcycle if you hit it, it is recommended to keep on your current path. If you swerve to try to miss the creature, he can easily jump in your way again. When you hit anything on your motorcycle, you want to hit it straight on, and while we all love our furry forest friends, your safety is number one priority. It is never fun when you are stuck on the road longer than you attended, and it is starting to become dark. And as the light dims more and more, you realize that the stock light that came with your bike is far from great. This is easy to happen to new riders. When you get your first motorcycle when at home check how the lights are during the night. Is it well enough to drive with? Would you prefer something better if you were stuck on a road far from home in the middle of the night? Johan has added H.I.D. Xenon lights to his KTM 950 Adventure and it has been very useful. We will add lights to the Honda Transalp as well – while I don’t plan any night riding on my trip to Prague, it is always better to be prepared for the worst!